A recognisable posture to most people, vrksasana or ‘tree pose’ is probably one of the first balancing postures you’ll learn in a class. While it looks simple enough, this posture works not only to improve our sense of balance, but it helps to open the hip, and strengthens the intricate communication between the 26 bones, 33 joints, 107 ligaments and 20 muscles & tendons of the foot…. As you may have noticed by now, most yoga postures are named after things found in nature; reptiles, birds, animals, fish, insects and plants, as well as nature’s contrasting energies; Chandra or ‘moon’ and surya or ‘sun’ (as found with the ‘chandra namaskar’ and ‘surya namaskar’ sequences). The ancient Yogis took inspiration from their surroundings, and so nature influenced their practice. It’s not just the physical attributes of each posture that we tap in to when practicing the different asanas though, it’s the energetic ones too…. Visually, tree pose looks basically as much like a tree as we’re going to get, but when we go beyond the physical aspects of the posture and focus on the energetic qualities of the pose, that’s when we really begin to understand the practice. There’s a simultaneous movement of rooting down and extending upwards here; just as trees fix their roots to the earth and reach their branches high, we too can tap in to the aspect of rooting through the standing foot, and extending upwards with the spine. We know our minds are supremely powerful, so actually visualising roots growing out of the feet and connecting in to the earth really can help to bring a greater sense of stability in to the posture. The most noticeable thing about balancing is wobbling – it happens. A lot. A great little thing to remember though, is something I like to remind anyone in class when practicing this posture…. It’s always the trees that allow themselves to bend and sway that don’t fall…. the trees which stay rigid are often the first to break in a storm…. We can apply this to our practice by remembering to lean in to any sense of wobbling we feel. Allow yourself to sway and bend, and see not only how much more fluid and easy the posture becomes, but how much more fun it is, too. As we know, there’s a whole lot of anatomy in your foot, those bones and muscles have to do something to help keep you standing…. Balancing doesn’t need to be thought of as a static and rigid thing; it’s the constant adapting, shifting and cooperating of the different parts of your body. Everybody wobbles, it’s just that some wobbling is a little more obvious than others! As always, it doesn’t matter what your posture looks like compared to anyone else’s, it’s how it feels to you that matters most. Begin by standing in Tadasana (mountain pose) and focus on rooting down through the three points of the feet, while drawing up through the inner arches, creating pada bandha (the foot lock). Visualise roots growing from your feet in to the earth, and from that firm rooting begin to extend upwards through the spine to the crown of the head. Stay here for a few breaths until you feel ready to move on. From Tadasana, move through five rounds of surya namaskar A in order to quieten the mind with a little bit of movement. As we know, balancing postures are a little easier when there’s not a whole lot of chatter in your head…. From there, come back to Adho Mukha Svanasana (downward facing dog), and step through to Virabhadrasana 2 (warrior 2). Use your time here to focus on sinking in to the hips to open out the groin muscles, which need to be a little warm and open in order to find the full opening of the hip in Vrksasana (tree pose). Once you’ve held Virabhadrasana 2 for 5-10 breaths, bring the hands to the floor and step back to Adho Mukha Svanasana before practicing on the other side. After you next return to Downward Facing Dog, step or jump the feet to the front of the mat, and come back into Tadasana (mountain pose). From Tadasana, come back to focussing on the grounding of the feet. Again tap in to the aspects of simultaneously rooting down and extending upwards through the body. When you’re ready, inhale and bring the sole of the [right] foot in to the left leg: the foot could be at the ankle with the toes still touching the floor, at the side of the lower leg, or against the thigh – as long as it isn’t pressing against the knee. The knees are a hinging joint, and trying to push them towards anything other than their natural back and forwards motion is likely to disrupt the ligaments and tendons surrounding the joint. So if your foot won’t reach the thigh, practice some Satya (truthfulness) and bring the foot down to the lower leg! When the sole of the foot is against the leg, open the knee out to the side as much as feels comfortable for your hip. The tailbone is likely to start sticking out here – creating an exaggerated arch in the lower back and disengaging the core. Bring your tailbone to lengthen down in to the floor, while drawing the lower belly gently in and up and lifting through the pelvic floor – all of which are actions that help us to connect to our core. Ensure the toes of your standing leg are spread and not gripping the floor. Drawing the knee cap up in to the thigh so you’re able to use the strength of the whole leg, rather than just the foot. Remember it’s OK to wobble…. Your deep front line draws up the center of the body, and if you visualise drawing in towards this center, you’re more likely to feel stable. Press the leg and foot in to each other, and bring the palms to the chest to firmly press together. These actions help to draw in to the center of gravity and provide a little help with balancing. Either stay here, or if it’s comfortable, then begin to raise the arms up through the center line above the head. With the palms above the head, part the hands and reach the arms out while drawing thr shoulders gently down the back. With your arms outstretched, allow yourself to gently sway from side to side, using your deep inhales and exhales to keep the body calm as you practice balancing. If you find balancing particularly difficult, it may be useful to practice next to a wall so you can either hold on to it, or just have the peace of mind to know it’s there if you feel wobbly. Stay in your Vrksasana for 5-10 breaths, or longer if it feels comfortable. When you’re ready to transition out, release the top foot from the leg, and come to stand back in Tadasana before practicing on the other side. To counterpose Vrksasana, come to sit on the ground, and make your way in to Gomukhasana (cow face pose) to rest the legs and open the muscles of the outer hip. 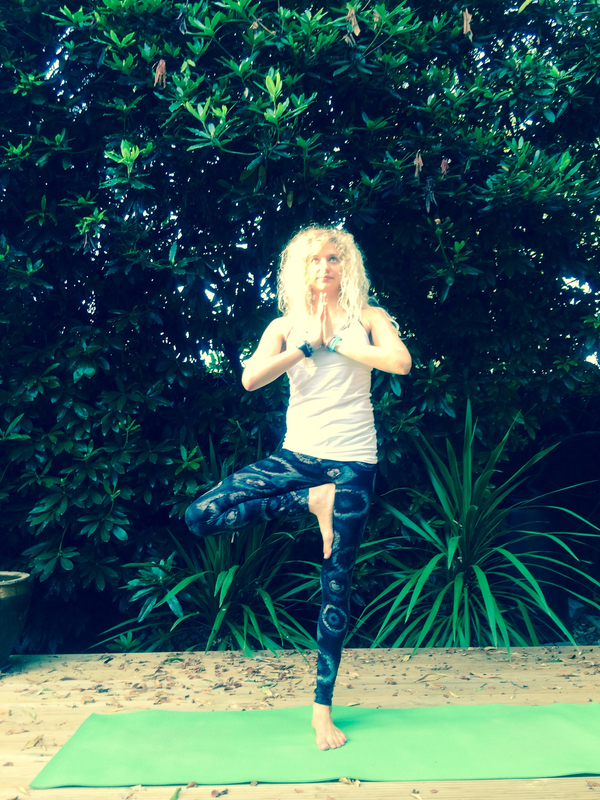 The next time you feel a little wobbly – whether it’s in your practice or in life – visualise the energetic qualities of the tree with it’s strong roots allowing you to stay grounded. I’ve just come across your post on Vrksasana, and it’s really beautiful. Very practical, full of handy hints and lovely philosophy. I’ve been looking to see if I could get to Loose Yoga soon and came across your FB page. How lovely ! Thank you .